Leaving Ireland, we headed across Wales and drove south toward London. Our ultimate goal was to work our way to Continental Europe, crossing the English Channel, and taking in a few sites along the way. Some sites were planed, while others were just stumbled across, either way, we continued to be amazed by the rich history of the United Kingdom. One such event that was found by luck, was the Dubdayz Summerfest. Dubdayz is a three day, UK Volkswagen show in Nottingham, England. Right away we realized the event was going to be quite different than events held in the states. 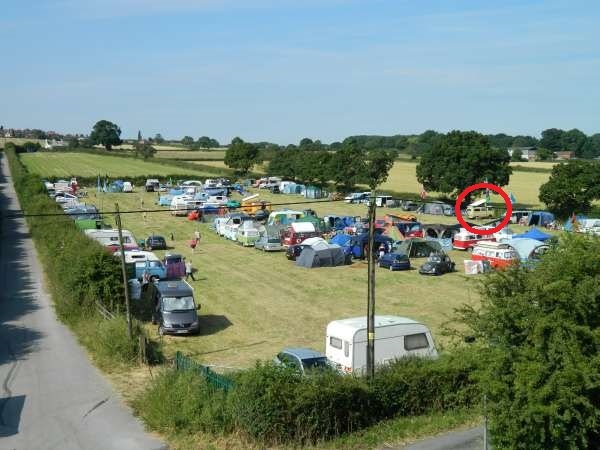 In the UK, Volkswagen events seem to be more about the camping and the party, rather than strictly the show. We found our spot, set up camp (along with 1500 others), then began to take in the experience. It was almost like a huge family reunion with friends circling their campers to provide a camp. There were young and old, parents and children, all enjoying the weekend. There was even a Freddie Mercury impersonator on a small stage that provided the entertainment. Without reservations, we were placed into the overflow lot. There were a total of 4 lots (fields with freshly cut grass hay) this one being the smallest. 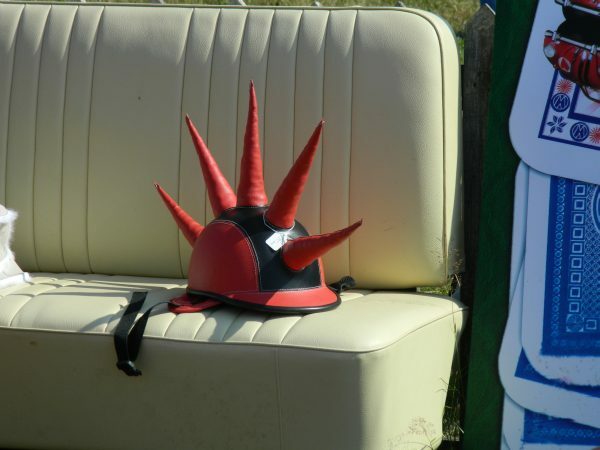 At one of the swap booths I found this English riding helmet, modified Volkswagen style. How stylish would I be wearing this to one of Julie’s horse classes. We visited this memorial with the intention of staying just a short while., instead our visit took most of the day. 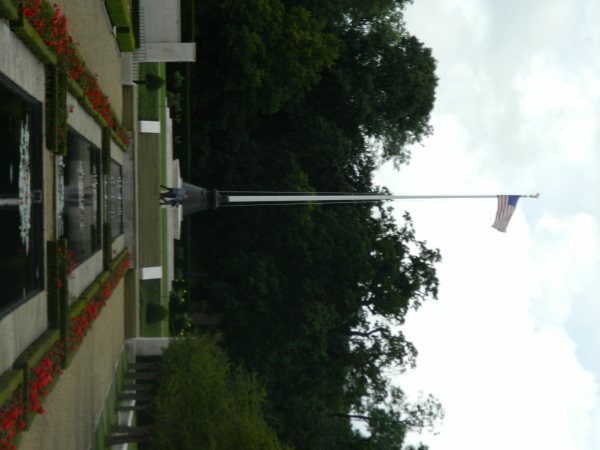 The Cambridge American Cemetery is the only World War II American cemetery in the United Kingdom. 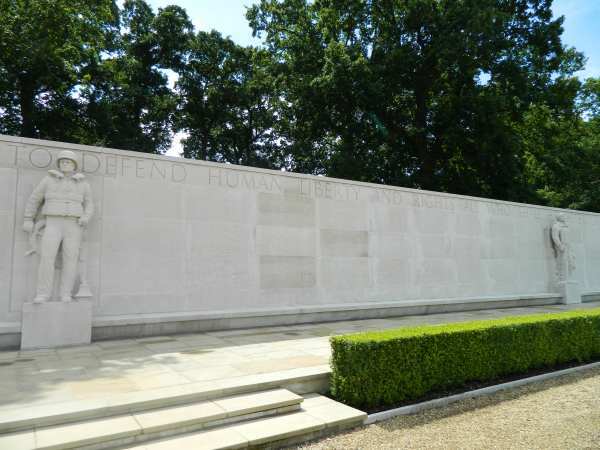 It contains 3,812 graves of those who lost their lives in the skies or in the waters in and over the British Isles. In addition to those buried in the cemetery, there is a 427 foot long monument wall dedicated to the 5,127 missing US service men that gave their lives for freedom, yet their bodies were never found. There was also an ornate chapel and a visitors’ center. In the visitors’ center we looked through the museum detailing the American involvement in the war. The commitment to democracy brought more than 3 million Americans to Europe. It is staggering when you think about the total loss of life during WWII is estimated at 70 million people. It is one thing to read about the heroism of the young men and women, but completely another to touch their names, see their pictures and read their personal stories. It was an emotional visit. Section of the missing in action memorial wall. Several weeks ago while camped near Dublin, we had the opportunity to camp near an Italian man and his children. We began talking one evening (lucky his English was much better than our Italian), and we soon found our interests were similar. He expressed concern that his daughter was moving from home for the first time to attend college at University College Dublin, we could relate having Giana spending her summer working in Nicaragua, out of the country by herself for the first time. Our conversation then turned to our perceptions of our respective countries, many of which are not without merit. He then said me, “Some of my fellow Italians feel that Americans are pushy and selfish, always throwing their money around. 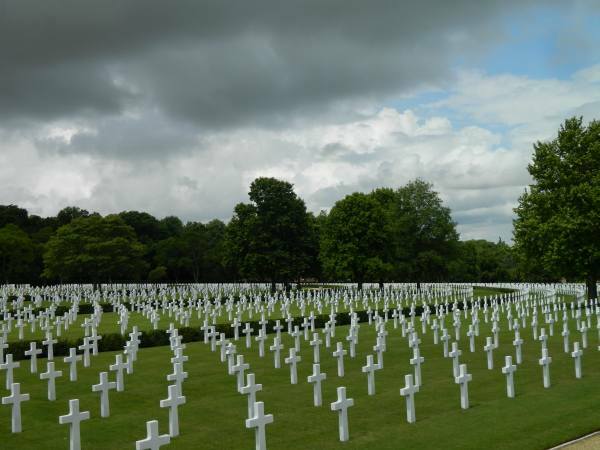 I tell my fellow Italians to visit Normandy and look at all the crosses, Americans don’t seem that selfish to me”. I was speechless. So enjoying following your wonderful trip and insights Jeanette and Steve! I’m also learning a lot! Happy travels! Hope we get to see you here on the return! Thanks Tina, I hope all is well with you and David. Steve and I are having a great time. As you know, travel really changes one’s perspective of the world. Take care. Another exciting adventure, a vw party!!! !